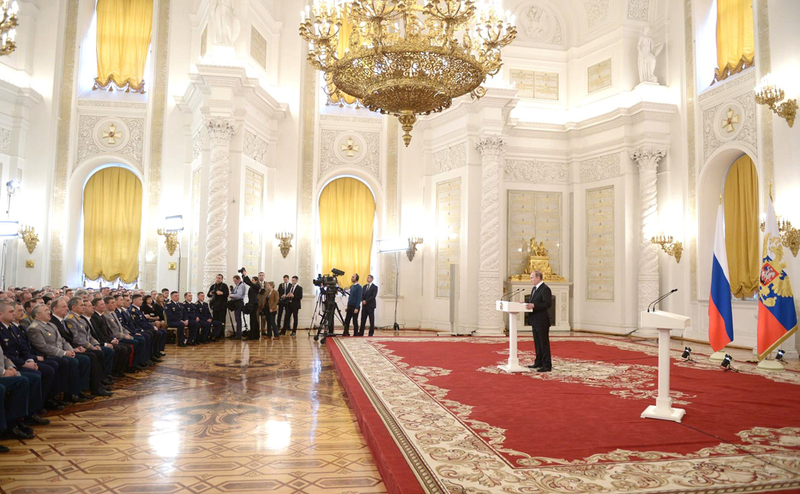 Vladimir Putin has delivered state awards to Russian servicemen. Russian President Vladimir Putin has delivered state awards to military and defense industry specialists who distinguished themselves during special missions in Syria. The golden stars of Heroes of Russia were received from the president's hands at the St. George Hall of the Kremlin on March 17 by Col. Gen. Alexander Dvornikov, chief of staff and first deputy commander of the Central Military District; Col. Viktor Romanov, senior test pilot of the flight test center 929 of the State Flight Test Center; Maj. Andrei Dyachenko, deputy commander of the aviation squadron N47 of the mixed regiment of the sixth army of the Air Force and Air Defense; and Col. Vadim Baikulov of the Main Directorate of the Russian Armed Forces General Staff. Yury Yarovitsky, chief of staff and first deputy commander of the first tank army of the Western Military District, received the St. George Order; Sukhoi Aviation Holding Company's branch director Sergei Smirnov was presented with IV Degree "For services to the Fatherland" Order. The Orders of Courage were received by Lt. Col. Nikolai Nozdrenko, head of artillery division; navigator Maj. Andrei Zakharov; Lt. Col. Yaroslav Yakunin, deputy commander of the flight training regiment. The Sign of Distinction - IV Degree St. George's Cross - was awarded to Jr. Lt. Oleg Baranov, unit commander and intelligence agent of the rocket artillery brigade N810 of the separate naval infantry brigade of the Black Sea Fleet and Jr. St. Alexander Anshukov, an operator of unmanned aerial vehicles. Medals of the "For Services to the Fatherland" Order were presented to 2nd Captain Andrei Adamsky, commander of the Rostov-on-Don large submarine of the Novorossiysk naval base of the Black Sea Fleet, and Sr. Lt. Yelena Veselova, an engineer from the signaling division of the Aerospace commander and control center.